If you have a fancy Belgian waffle iron at home that's tucked away in a cupboard gathering dust, bring the versatile kitchen gadget out and let it see the light of day! Waffling foods is a great way to get a crispy exterior without all the extra fat and calories other cooking methods can add. It's best to use a waffle iron with deep pockets, such as a Belgian one, to accommodate the ingredients. Jump on the waffle wagon! 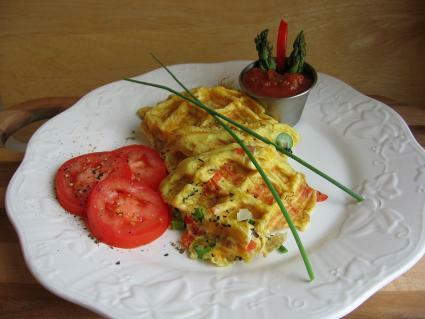 This breakfast or vegetarian main meal is so versatile. Vary the ingredients to suit your tastes -- substitute zucchini or another vegetable for the asparagus, use Parmesan or Swiss cheese instead of cheddar, and so on. This will make a hearty one-serving breakfast or vegetarian meal. If fleshed out with toast or fresh fruit, it easily can serve two. In a small bowl, whisk together eggs with salt and pepper. Add asparagus pieces, red onion, red bell pepper, and cheese. Mix with a rubber spatula until well incorporated. Heat a Belgian waffle iron on low according to manufacturer's instructions. Place a plate under the waffle iron to catch any drips. When heated, lightly coat both plates with cooking spray. Stir the frittata ingredients and pour onto the hot iron. If necessary, spread the ingredients so they are well distributed. Close the iron and cook for 1 minute. Check to see if the eggs are set. If not, close the lid and cook for another 30 seconds to 1 minute. Don't overcook! If the frittata is hard to remove, turn off the heat and let the frittata sit for a few minutes with the lid open until it firms up. Remove to a serving plate. Depending on the flavor profile you choose, you can serve this with salsa, marinara or even ketchup, and fresh chives, if desired. Sliced tomatoes seasoned with salt and pepper on the side make a nice presentation. 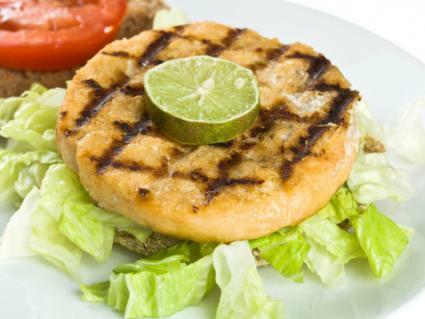 Crispy-crusted salmon patties naturally lend themselves to being cooked in a waffle iron. You can make this with fresh cooked salmon or good-quality canned salmon or crab meat. This recipe will make two generous patties that are perfect as a main dish or appetizer. Use a small round waffle iron to make them perfect for serving on a bun. In a medium bowl, mix fresh chopped salmon or drained canned salmon with 2 tablespoons dry white breadcrumbs, mayonnaise, onion, dill, 1/4 teaspoon salt or to taste and 1 1/2 teaspoons fresh lemon juice. If mixture is too loose, add more breadcrumbs. If it's too dry, add more mayonnaise. Divide mixture in half and form into two patties. Dredge each patty separately in all-purpose flour, then dip in beaten egg and then in dry white breadcrumbs or panko crumbs. Let sit at room temperature 10 minutes before placing on the waffle iron. Heat a Belgian waffle iron to medium setting per manufacturer's instructions. When heated, lightly coat both plates with cooking spray. Place one patty at a time on the hot iron. Close the lid and press lightly. It's normal for the lid to be slightly ajar. Cook for about 2 minutes or until crispy on the outside and the patty holds its shape. Remove to a serving plate and repeat with remaining patty. Serve with homemade or purchased tartar sauce or remoulade sauce and garnish with a fresh dill sprig. Red velvet flavors and brownies are a match made in heaven. This dessert comes together in a snap by using a packaged cake mix. Drizzle a cream cheese glaze over the brownies while they are still warm. They can be served with vanilla ice cream and a drizzle of chocolate sauce for extra decadence. In a medium bowl, mix together cake mix, melted butter, egg, and water until well incorporated and no streaks of dry ingredients are visible. Heat a Belgian waffle iron to low according to the manufacturer's instructions. Place a plate under the waffle iron to catch any drips. When heated, lightly coat both plates with cooking spray. Place 1 cup of brownie batter in the center of the hot iron. Use a spatula to spread the batter evenly. Close the lid and press lightly. Cook for about 2 minutes or until firm to the touch. Turn off the heat and let the brownie sit for a few minutes with the lid open until it firms up. Remove to a serving plate and repeat the process for the remaining brownie batter. Drizzle warm brownies with the Cream Cheese Glaze, see below. Serve with a scoop of vanilla ice cream and vanilla sauce, if desired. In a small bowl, whip together cream cheese, confectioners' sugar, vanilla, and milk. If mixture is too thick, add more milk. If it's too thin, add more sifted confectioners' sugar. The glaze should be pourable. 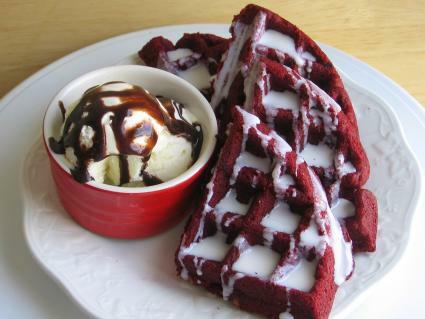 Using a waffle iron to cook turns ordinary foods into fun projects for kids and adults alike. It's an easy method for making one or two servings without an oven or stove top. In addition to being convenient, everyone can have a meal they enjoy eating by varying the basic ingredients to suit their tastes. Freeze extra portions to heat in the microwave for a future dinner.